About the instructor: As a life coach, Grace Mendez uses creativity regularly, both with her clients and as a sewing instructor. She values self-expression through the visual medium and she is fascinated by simple materials such as pen, pencil and paper that create works of art through the Zentangle process. Grace has a B.A. in Visual and Public Art, CSUMB, and she is a member of the Creativity Coaching Association. 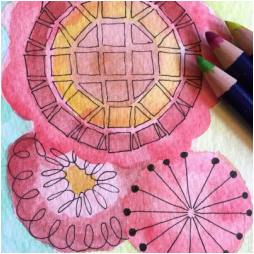 Workshop Description: In this workshop we will explore several ways to add color to your Zentangle images with Derwent Inktense Pencils. If you’ve never tangled, we will be creating Zentangle-Inspired Art, a fun offshoot of the traditional Zentangle method. It’s fun and easy to learn. If you have taken Introduction to Zentangle and are ready to go further with your images, adding color adds a new dimension. Notes: No prerequisite. Limited seating! Materials: Teacher will provide supplies to share in class. If you would like to bring your own, request a supply list.